The other day I tackled a project that had been on my mental to-do list for months now. We have these really comfortable pillows on our couch upstairs that I say are not actually allowed to be up here because they are too ugly. I guess it is not that they are ugly, I just don't feel like they match with the rest of the room at all. Well, even though they are not allowed to be upstairs they always are so I wanted to recover them. A while ago I found some really awesome fabric that I thought would look great as new covers for the pillows. I bought it and it sat in my office for months until, like I said, I finally got around to covering those pillows. And guess what? I don't like the finished result. Ha! It is so weird because I love the fabric and I think the colour is great. I just don't feel like it really goes well with the colour of the couch or the pink on that blanket. I was very suprised when I plopped the pillows down on the couch, stepped back to admire my great work and was less than impressed. I don't actually mind the way they look in this photo because I think the pillow colour looks really great with the curtains and the wall. Ivan is not sold on them either so I'm positive this is going to be a temporary solution until we either recover them again or find some ready made pillows that we think would be a good match. 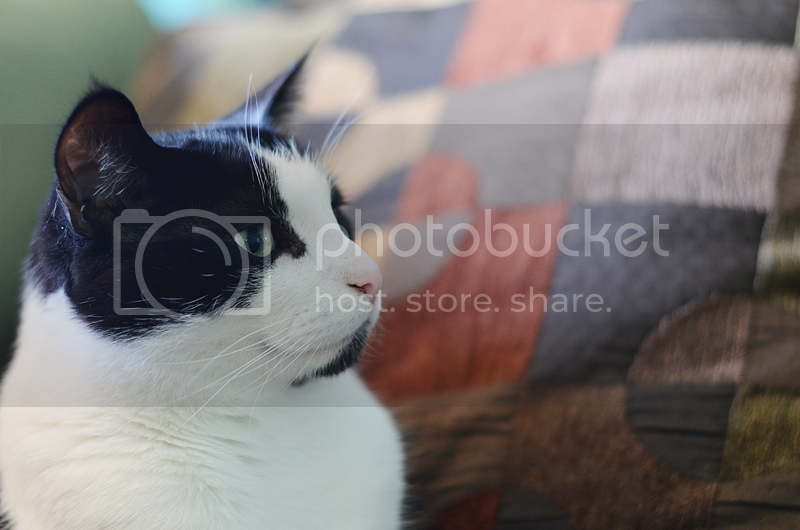 So, why the heck am I sharing these photos if I don't love the way my project turned out? Well, I think it's ok to make mistakes and I don't mind sharing mine with the world. I mean, they are not so awful that looking at them makes me throw up...it's just that I know it could look way better. Have you looked forward to a project for a long time only to complete it and have it not turn out they way you hoped? I hope everyone has a great Wednesday. I am enjoying working in my new office and I plan on spending the day in here sifting through my emails because I know there are some that have slipped through the cracks in the last few weeks. Could you tell me how you made that blanket? I find it really really refreshing that you are sharing these with us! To be honest, I am always starting projects and disliking the results - so it's really nice to hear super creative people such as yourself still have the same problem sometimes! You know what.... honestly, they do look pretty with the wall colour... they add an extra little "pop!". I totally love orange, but you're right, with the minty colour of that couch that colour just doesn't sit right. Do you still have your white couch?? I think the orange pillows would look amazing with it, and the blue walls! Makes me think of frozen desserts, like an off-colour Rocket, haha! And the patterns of the pillows before you recovered them is serious almost identical to some fabric the Shaw used on some chairs for last seasons production of Present Laughter. Seriously, I had to do a double take! Come to think of it, I think we bought that fabric in Hamilton! We do have the white couch but it has bright green pillows on it that would look even worse on the green couch than these do! These gold pillows do look better on that couch but they are also a little big for it. That is funny! 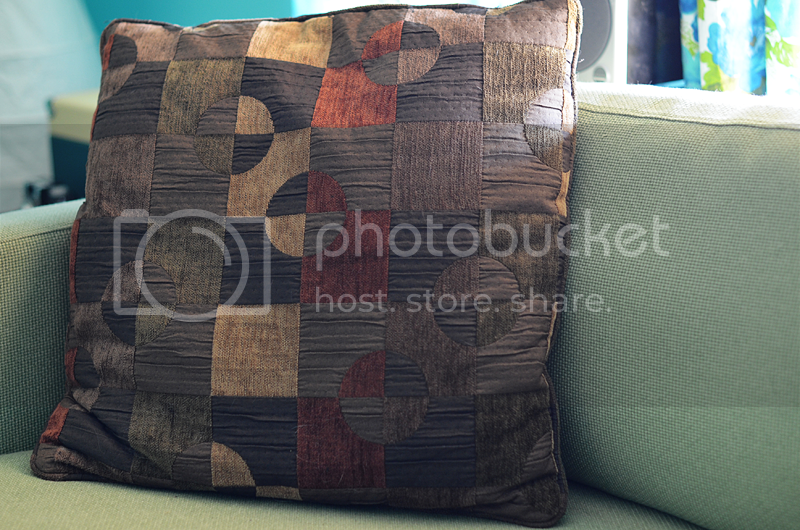 The original pattern came on the pillows when my mom bought her couch years ago. Ha! Yes, this has happened to me too, many times :) Oh well, they do look better than they did! Maybe you'll warm up to them. If you like it, I have the pattern and you can use it if you want. That way you can keep some of the fabric you've used and maybe add some other fabrics that have some of the other colours of the couch and blanket and curtains in it? This happens with me alot with projects that go unfinished until months (even years later: hence my blog which I finally have time for to be consistent about). The orange pillows are great and all, but like you said..I can see where you said that they do not match. Since there is already a light green, red and pink, I would honestly go with a light grey just to make all the tones in the room go together without being a rainbow (and that isn't a bad thing if things are rainbows, but you know!). They are certainly an improvement on the old pillows. And the colour is so beautiful against the wall colour. Most all of my projects don't quite live up to expectations. I can never transfer what I see in my head to reality. i think they are gorge ! The yellow goes lovely with the couch ! You could also just remove the blanket from the top of the couch! 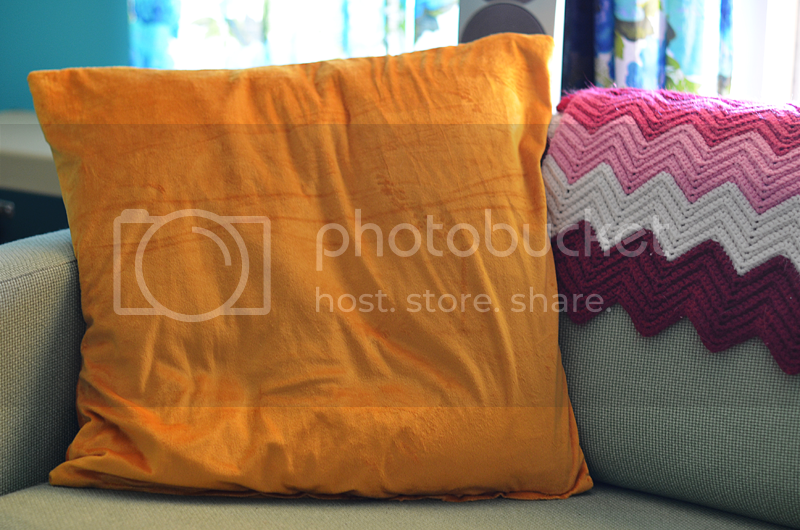 the color of the pillows does look funky with that pink, but it works with the walls and color of the couch so it'd be easier to remove the blanket! I really do love that you shared even if you don't like it. The pillow is great though - maybe there is another room of the house to put it in or put it on a chair or something for the cats? Whenever I mess things like that up (for me it's usually like...I angry sewed something and it's ugly though!) I re=purpose it for the dogs.